An epic, empty Labour power struggle. Two days after the British general election, Alan Watkins died. He was the doyen of London political columnists, after nearly half a century of writing weekly, wisely, and wittily about Parliament, and the Tories (his book, A Conservative Coup, is the best account of the fall of Margaret Thatcher), but, above all, the Labour Party, which he knew intimately. Since he died, I’ve often wished I could ask Alan what he thought about the latest contest for the Labour leadership. This was the first election since 1974 in which no party gained an absolute parliamentary majority. It seemed likely that some kind of pact would be reached between David Cameron’s Conservatives, who had the largest number of seats, and Nick Clegg’s Liberal Democrats, until the electrifying news on the following Monday that there might be a deal instead between Labour and the Lib Dems to keep the ruling party in power. But this proved to be a last flick of the dying serpent’s tail, in the form of those backstairs wheeler-dealers, Alastair Campbell and Peter Mandelson. By Tuesday evening, Cameron was on his way to Buckingham Palace to kiss hands with the Queen, in the sonorous phrase, having agreed on terms for a coalition with Clegg; and Brown had resigned with some modicum of dignity after announcing the day before that he would quit the leadership of the Labour Party. Other hats have been thrown in the ring, notably by Diane Abbott, who has more than one selling proposition: Unlike the others, she isn’t male and she isn’t white. She’s the daughter of working-class Jamaican immigrants and was a relentless left-wing critic of the Blair and Brown governments, on questions from Iraq to civil liberties. She also has no chance of winning, not least because the odds are deliberately stacked against her and other potential outsiders. Before nominations close, a candidate must secure the backing of 12.5 percent of the parliamentary party, which now means 33 Labour MPs, no easy task and not meant to be. Even so, and, even though this is meant to favor the party establishment, it must be disconcerting to David, Ed, and Ed to find a poll revealing that Abbott is the most popular candidate among the British public. Our new prime minister was educated at Eton and Oxford, his deputy at Westminster and Cambridge, two ancient public schools (English-style) and universities. But then, these Labour men are not so dissimilar in generation and formation. Balls is 43 (the same age as both Cameron and Clegg), the Milibands are 44 and 40. Both brothers went to Oxford, as did Balls, before he proceeded to Harvard. All three belong to our New Class of apparatchiks, or, at any rate, they worked as researchers and aides before being elected to Parliament. What they have in common as professional politicians transcends any ideological distinctions, and there is frankly little to differentiate them in terms of policy. Or one thing only: the legacy of Blair and his commitment of British forces to Iraq. Both the Eds have railed against the war, while David refuses to repudiate it, saying, “it’s time to move on.” But then, it’s easier for them than for him. Just as Barack Obama, unlike Hillary Clinton, wasn’t in the Senate to make a difficult choice when the war began, so neither Ed was in Parliament, leaving them uncompromised by having voted in favor, as David is. All of the candidates are uneasily aware how much of the New Labour record the electorate finds distasteful, from the uncritical support for the Bush administration to the equally uncritical adulation of high finance to the creation of a cctv-surveillance state. But, for those who loyally served the last government, it’s hard now to repudiate it entirely without seeming opportunistic and hypocritical. It looked, nevertheless, as though Denis Healey, on the social-democratic right, would become leader, until Watkins achieved one of the scoops of his career, and one of the best bets. He sent a telegram—it was that long ago!—to Michael Foot asking his intentions, and Foot duly declared his candidature. The affable if ineffectual figurehead of the romantic old left, Foot was a writer and book collector who had been an MP, on and off, since 1945. Watkins had already asked me (a more seasoned punter, if not always a successful one) to find out the bookmakers’ odds. They gave Foot no serious chance, offering 14 to one, but Alan knew that, for various reasons to do with internal Labour politics, his prospects were far better than that. We both bet on him, and he narrowly beat Healey on a second ballot, while two scribblers drank champagne on the proceeds. Oh, and, in the 1983 election, Foot led Labour to its worst defeat since World War II. The leadership contest that elevated Foot was the last to be decided by Labour MPs alone. Where the Bennite left won out was in replacing that admirably simple system with an “electoral college,” in which MPs would have 30 percent of the votes, the party members 30 percent, and the trade unions 40 percent. (The weighting has since been changed to allot each sector an even third.) This bizarre hybrid makes elections difficult to call, especially now that genuine party membership is so small and the unions’ intentions so obscure. Moreover, the alternative vote is used, and it’s reckoned that “second preferences” will favor Ed Miliband. David started as a heavy favorite, but the kid brother’s odds have considerably improved over the past few weeks. The answer is that they were both caught up in the spirit of the age, the correct recognition that traditional state socialism had run its course not only on the imploded eastern Leninist model but in its gentler British version. And yet, as the careerists forged their careers, they failed to notice just how far and how fast Blair was moving to the right. 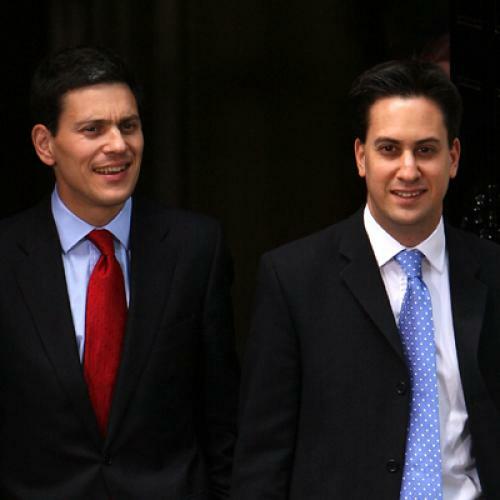 Ed Miliband says that David is “my best friend,” and they have naturally refrained from open mutual abuse, though that still raises the question of what unconscious fratricidal passion leads Ed to try and ruin that friend. Whoever wins will have a hard task ahead. Ralph Miliband’s Marxism is a memory, traditional socialism is dead, and even moderate social democracy is in poor shape. But that doesn’t explain the astonishing transformation of New Labour into what is, by historical standards, a party of the center-right, which, now that it has lost power, looks even more of a moral wreck. Not long before Blair won his first election, Alan Watkins wrote that, although the party had gone along with Blair in the hope of avoiding yet another defeat, the truth was that, in their hearts, most Labour MPs hated what he was doing to their party. By now, that cynical bargain has finally corroded the party. Not only has everyone observed for some time that Clegg’s party now stands to the left of Labour—which is why the old radical Watkins cast a postal vote for the Lib Dems from his deathbed—but even the Tories seem more liberal than Blairite Labour in many respects. Cameron has said he will get tough on the wilder excesses of hedge-fund speculation, and he has won plaudits from civil liberties groups by promising to scrap Labour plans for compulsory ID cards and police DNA banks. Our unlikely coalition government has been embraced by a solid majority of the electorate, and, in any case, the crushing defeat at the ballot box on May 6, when Labour won only 29 percent of the popular vote, leaves the party Blair, Brown, Mandelson, and Campbell created without even its ultimate justification of electoral success and the fruits of office The leadership contest might afford Labour the opportunity to debate whether today it has any remaining purpose. If not, whoever is declared the winner in September might be looking at a very long stretch as the leader of Her Majesty’s Loyal Opposition.